Is Your Dental Office Running With A Couple Of Handbrakes Still On? The best practices are the ones run with systems, protocols, checklists and accountability. If your Dental office is running without these then you’re kidding yourself, because it’s like driving an unserviced car. Sure the car runs fine, but one day the engine is going to seize. One day the brakes are going to fail. Or your tyre is going to blow out because your wheels have been running crooked and wearing a baldness on the inside that you cannot see. And while your car has been going along OK, or so you thought, you’ve gotten less fuel economy, your tyres have worn out quicker and now your discs are shot because you forgot to check your brakes. Well you may well be. But while you’ve been watching the road, your car’s been over-revving, chewing up fuel, chewing up brake pads and discs and chewing up tyres way quicker than it needed to. All because you chose to watch the road and not check on the car. Or you chose not to have a co-driver watching your gauges. Down at my farm I’ve got a Toyota Hilux. And every week when I visit down there it’s my duty to take the Hilux for a twenty minute run so that the engine keeps moving and the seals don’t perish. Occasionally I’ve been guilty of taking the Hilux out and travelling along the open road with the handbrake still on. Now I know that’s not good for the Hilux, and it’s really not good for the handbrake pads and cable either I’ll bet. And for me, I feel like giving myself an uppercut for being so stupid. But I’m not Robinson Crusoe. I’m not the only driver in the history of the world to drive a distance with the hand brake on. But I don’t feel any warm fuzzies when I discover my error. It’s funny, as a dentist, I thought I was a pretty good driver. I could get my practice going really fast. But when I hired a consultant to help me, the first thing they did for me was release a handbrake or two. And boy did my dental practice really fly then. It’s the same in golf. Sometimes you think you’re doing something pretty well, but with a couple of tweaks from a golf pro you’ve got that Titleist soaring longer and straighter than ever before. When I have a lesson from my golf pro he sees what’s going on behind my back. He sees me from all angles. He sees the top of my swing. He sees my set up. He sees my follow through. I’m just watching the ball. Sure I could read a golf magazine every month and get ten great tips and fix my own swing for less than ten bucks? Or I could invest in the help of a professional who knows what breaks and knows the best way to fix it? How many coaches does tennis star Roger Federer have? He’s got coaches for every part of his game. Federer has more than one coach. I’m thinking, in Dentistry, having less than one coach is the wrong answer. As a dentist, are you coaching your own business? My upcoming two day workshops will be held in Melbourne Australia in February and in Manhattan in April. 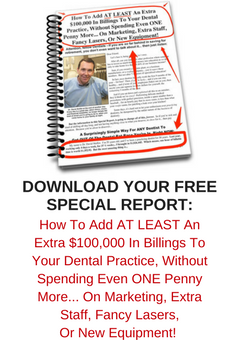 Have you read my book , How To Build The Dental Practice of Your Dreams [Without Killing Yourself!] In Less Than Sixty Days. The Ultimate Patient Experience is a simple to build complete Customer Service system in itself that I developed that allowed me to create an extraordinary dental office in an ordinary Sydney suburb. If you’d like to know more, ask me about my free special report. Did you like this blog article? If you did then hit the share buttons below and share it with your friends and colleagues. Share it via email, Facebook and twitter!! Five Simple Ways Your Team Members Can “Set Up” Your Preamble, So You’re GUARANTEED To Have Great Chemistry And Rapport With Virtually All Of Your Patients! One of the things that “C type” dentists find difficult to do is to strike up a conversation cold with their patients. When the dentist walks into the treatment room to greet the waiting patient, be they a new patient or an existing patient, one of the things that the engineer-type dentists finds very hard to do is to Segway into a conversation. C type dentists just want to get about doing the technical stuff they love to do without doing the touchy-feely stuff. And even for the D type dentists, they really don’t want to get bogged down into all that conversation when all they want to do is be productive. So what’s the best way for the team to go about this process or handover, pre-treatment, so that the dentist can effectively and efficiently converse with the patient, and at the same time progress into the actual treatment without hitting a War and Peace style roadblock. As you know, when I practiced, I mastered the two treatment room alternate appointment schedule. And it all came down to time management and hourly rates calculations. I cover this topic extensively in my two-day workshop. Suffice to say, one of the big advantages of being a dentist working out of alternate treatment rooms with two Dental Assistants [one in each room], is that the patient next to be treated can be brought down and be settled well ahead of time. At the same time, the next patient can also be seated comfortably with a beverage and engaged in meaningful conversation with the Dental Assistant who assumes a concierge style role at this time. They are to make the patient feel at ease, and to make the patient feel important. And so the best way for them to do this is to spend time with the patient and engage with them in meaningful conversation. The Dental assistant is not to be setting up her room *around* the seated patient, or worse still, *behind* the seated patient. The room set up must be completed before the patient is brought down. This is so that the next patient is indeed made to feel that they are special, as the Dental Assistant spends face-to-face time with that patient exclusively until the dentist arrives to begin the patient’s treatment. The next patient must feel that the dentist is coming in to see only them, as if they are his only appointment all day. Creating this feeling of exclusivity is impossible if the dentist is operating out of only one treatment room. Apart from the fact that the room must undergo a speed teardown and turnover, there’s no way that the patient can feel an air of relaxation being thrust into that one treatment room situation. And of course, in the one-chair situation, there’s the taboo topic of the warm seat. Nobody likes to feel, ever, that they’re sitting in a seat that’s warm. A seat that someone else has previously sat on, if you get my imagery. It’s just one of those unfortunate feelings we’d rather not be reminded of. So, if the patient is being brought down to the second treatment room well ahead of time, what are the best things for the Dental Assistant to talk to the patient about? Everybody loves to talk about themselves. A skilled Dental employee will have the ability to direct and redirect the conversation with the patient away from any topic of fluff, like the weather, or time, and back to being about the patient. For afternoon appointments, ask the patient how their day has been. For morning appointments, ask the patient if they have a busy day on. And then simply watch, and listen, as the patient starts talking. How do we continue on on this topic? If the patient is a regular patient of the practice in active regular treatment appointments at this time, there’s a reasonable chance that we’ve been able to find out from them about an event coming up in their near future that they could be looking forward to with some excitement, or with some trepidation. Information about this event could have been openly discussed by the patient with us on a previous appointment or it may have been mentioned in a passing moment and noted as a piece of Secret Service Information by a team member to be used at a later date. Either way, patient’s love to discuss impending events. Talk to the patient about their family. Do they have any children? Do they have adult children? Where do they go to school? Or their brothers and sisters? There are so many topics of conversation to be brought up when exploring the family situations of our patients. Patients love to talk about themselves. And what they do for a living is just a small portion of the rich tapestry of the life of our patient. If the patient turns up wearing workout clothes, ask them about their fitness regime. Similarly, look for golf shirts. If the patient is retired, ask them how they spend their time. If it’s a Friday, ask them what their plans are for the weekend. When they tell you what they have planned, ask them if they do that often. You’ll be surprised how much people love to talk about their sports that they play. 6. Discuss any travel Destinations the patient may have been to, or will soon visit, or wants to visit. Find out where they’ve been. Find out how the trip was. Find out where else they’d like to go. Find out anything else the patient aspires to do. Everybody has dreams and desires. And they love to talk about their aspirations. You can see, with this list of topics, that a good Dental Assistant can easily get a patient talking for hours about their favourite subject, themselves. Using these guidelines makes it simple for even your least experienced team members to quickly establish rapport with your patients, and then transfer that rapport and chemistry to you the Dentist at the appropriate times, so that you are guaranteed great chemistry with all of your patients. Do You Think That’s It, Or Do You Think That There’s More? It’s Christmas morning Down Under, and Christmas Eve afternoon in the USA. And as good a time as any to reflect on our achievements of 2015 and look forward to 2016. Do you rest on your laurels when it comes to achievements? Or do you reset your goals and raise the bar? In cricket, the pinnacle, as a batsman, is to score a test century. There must be great satisfaction, I would guess, in seeing the scoreboard post three figures beside your name, right there while you’re out in the middle. But with cricket, unlike in baseball, there’s the chance to carry on. There’s the opportunity to retake guard, and continue, as long as you physically and mentally can, and to go way beyond that score of 100 runs. As a fan of cricket, it always amazed me to see Test cricketers dismissed for scores in their low hundreds. Scores of 103, 105, 107. You know what I mean. I understand that the physical and mental act of getting to 100 is very draining. And once achieved, there’s a euphoria experienced that can take over, for a moment, and distract the batsman that there still is an opportunity to go above and beyond. As a spectator, it was fascinating to watch a test batsman, upon reaching one hundred, to re-take guard in front of his wicket. [The action of taking guard is what all new batsmen do upon beginning their innings. It is their way, of checking with the umpire, that they are positioned correctly to protect their wicket]. You would think, that a batsman having reached one hundred runs, would have a pretty reasonable idea of where his wicket was behind him after all that time in the middle? As a cricket tragic, I’m reminded of the Test innings of Australian batsman Bob Cowper in Melbourne in the summer of 1965-66, where he became the first Australian batsman to score a Triple Century on Australian soil. Cowper had a short Test career, retiring at a young age of 27. His innings of 307, still the longest time at the crease on Australian soil, was his first Test century in Australia, and took him a total of twelve hours and eight minutes to accumulate. Interestingly, as the match was constantly interrupted by rain, Cowper said his innings felt more like a series of separate innings rather than a single knock. Testimony to Cowper that his mental concentration allowed him to focus on the job at hand, and the opportunity, and that was to bat, and bat, and to bat. As I look at my own results in speaking writing and coaching for the year of 2015, I see great opportunities taken, and great results achieved. With writing, I’ve punched out two blogs per week, every week, like clockwork, all year long. Without fail. As a speaker, I’ve spoken in front of hundreds of paying Dentists this year, both in Australia, and the USA. Before this year, I’d not ever professionally spoken. I’d shied away from speaking. As a coach, I’ve more than doubled my number of private coaching clients this year. But best of all are the results my clients have achieved. Like Bob Cowper, my most impressive client results have been for those clients who have continued on with me into their second year of coaching. adds to their growth and record of achievement. One of my clients has added nearly $120,000.00 more to her collections this year compared to the results we achieved last year. And another of my clients is now collecting on average $45,000.00 more each month than she was this time twelve months ago. On the flip side, I’ve had a client finish up with me after only two short months when I discovered that his voluntary discounts to patients cost his practice over $35,000.00 last year. The thing is, that Dental Practice Ownership is a business. And as a business you can drive it hard, or you can coast. Coasting is fine, but there’ll always come a day, one day, while coasting, that you’ll wish that you had not. I bet every batsman who got out for a score between 100 and 109 wishes they’d applied themselves a little bit more that day. Because with a score of 100+ already, they really did have it in the palm of their hand. So in 2016, with regards to your Dental Practice, are you holding opportunity in the palm of your hand? Do you have what it takes to re-group, and score that triple century? [As an aside, Bob Cowper retired from test cricket at a young age to pursue a career in Banking and Finance. As a banker, he amassed wealth of well over $100M, and now lives primarily in Monaco. There are some behaviours that must never appear when treating a patient, if you want to make a lasting impression. Here are some of the most important things you must never do, while you have a customer in the chair. Remember, they’re paying for your time. It’s on their nickel. And as such, they deserve a few common courtesies. In fact, they deserve a lot of courtesy. Because if there are any courtesies missing, they’ll march, with their feet, off to another dentist who treats them with respect. 1. Never ever conduct a non-patient conversation with your staff, as if the patient isn’t even there! Conducting a conversation that discludes the patient, and is about something irrelevant to the patient, is the height of arrogance and rudeness. Patients will feel rejected, and at best, ignored by this divisive behaviour. To be on the safe side, it’s always best to NOT ever converse with your staff at all about anything. If the patient feels as if they’re not even there, while the dentist yabbers on with his staff member and they’re paying for this time, they’ll not tolerate this behaviour for long. Very shortly they’ll be looking for another dentist who values and respects their presence. I only ever had TV and radio on in my office as background entertainment. The TV on the ceiling worked extremely well in acting as a visual distraction for patients to look at and watch (without sound). It allowed the patients to drift off to another relaxed world, without having to worry about what is coming up next for them in the moment of Dentistry. I would never acknowledge the presence of the TV. My role was to treat the patient, and respect them. To attend to the TV would distract me from that purpose. It was exactly the same for radio. In fact, towards the end of my career, we replaced the radio with laid back easy to listen to relaxation music, that was purely there for the pleasure of the patients, and not for the dentists or the staff. Again, our role was to attend to the patient. 3. Never say the patient’s name incorrectly. This is the height of rudeness. Always know the patient’s name and how it is pronounced. For each and every patient. If you don’t know their name, or you’re forgetful, then use the Post-it Note. There’s no excuse for not learning and remembering the patient’s name. If you want them to pay you, if you want them to keep coming back, of you want them to like you, then always use their name during the appointment. And patients can tell when you’ve forgotten their names. “You’re welcome”. “It’s my pleasure”. Whenever we speak we should always be mindful to use the common courtesies whenever we can. Because people will notice when we do not use them. They’ll notice the absence of common courtesies more than they’ll notice the presence of common courtesies. And they will notice the use of acceptance courtesies as opposed to the use of deflecting statements. It’s far more polite to say, “it’s my pleasure”, than it is to say “no worries” or to say “not a problem”. “Worries” and “problem” are negative words. We want to keep the tone elevated. We don’t want to hear those negative words in our office. The patient is paying for your time. Give them all of it, and more. Don’t short circuit the appointment. The patient will always notice when you leave the room, when you talk about non-dental things with your team, when you take personal messages and phone calls. And they’ll leave your practice if they feel ignored or taken for granted. So don’t supply them with any ammo to do this, just because you think they don’t notice. I always regularly checked in with the patient being treated with kind questions of concern accompanied with light touches on the shoulder. Patients responded very well to both the vocal as well as the light physical connection, while being treated. Whenever I spoke with the patient I always asked for feedback with open ended, open loop questions. Rather than simply vomiting up information all over the patient, I needed to be sure they had full appreciation of the message, or instructions, that I had told them. Patients need a Clear. Next. Step. And if they’re unclear, or confused, they’ll be more likely to not re-appoint, or make an excuse, or cancel their next appointment. So it all comes down to the Doctor, and then the team, making sure that the patient leaves with total clarity. “Love your patients to death” was a phrase that I was told early in my career, that’s stuck with me through time. Treat them with respect. Respect their time. And as Mary Kay Ash said, “Make them feel important”. How Are Your Goals Then? As we approach Christmas and New Years it’s really that time of year again that we need to be reviewing our goals, and planning our expectations and goals for 2016. The end of one year and the start of a New Year is as good a time as any to review your current Goals and to set new ones. Two years ago I wrote two great blogs on goal setting. Here I’ve updated those thoughts, combined into a very thorough analysis of the goal setting process and its benefits. Remember that it doesn’t have to be the start of a New Year for you to set new goals. You don’t need to wait for the end of one year, or the beginning of another, before you begin to update your goals list. Goals can be set at any time. And they become effective from the moment they are created, provided you do just that…you create them. Because a poorly created goal becomes just a wish, or even worse, an idea only…. And as wishes or ideas, they are less likely to be seen through, less likely to be acted upon and less likely to be of inspiration than would a fully fledged written down, thought out and crafted goal. So, what’s the best way of going about setting goals? Firstly, I’d like to say, there is no *best* way. But there needs to be some way. There needs to be some purpose, or definition, to the task of setting goals. A goal, on its own, can be created at any time. An idea that just pops into your head can be acted upon, categorized, and remembered to become of such worth and such intent at a later date. So never discount or discard a thought or inspiration just because you aren’t officially at “goal-setting time”. Having said that, I think allocating and marking off a specific time duration in advance, and keeping that “appointment” with yourself, is the best way to go about setting goals. So what do you do David? This is how I go about setting goals. It’s my way of doing it. It’s not *the* way, but it is a good way. Firstly, I tell myself that I need to set my goals. I need to set myself the task of setting goals. Once I’m comfortable with that action requirement, I then choose myself a day and a time of day to do it. It’s like making a doctors appointment. You know you need to go see the doctor, so you make the decision. Then you think to yourself, what would be the best day for me to see the doctor? And would mornings or afternoons work best for me? Allocating goal setting time is much the same. I also leave my goal setting time open ended. I don’t back up another task, like lawn mowing, or dinner cooking, right on top of the goal setting. Because of this, I feel that mornings after breakfast is the best time for me to sit down and set my goals. Goals, by definition, need to be written down. This is a Golden Rule. A goal must be written down to truly be a goal. Otherwise it’s only a wish. A dream. An idea. A concept. So you need pen and paper. Or something to record your goals. I use pen and paper. I like to scribble. I like to write them. I like to expand on them. I like using system cards. 3×5 system cards. The reason being, as I write, I tend to want to categorise my goals. So I tend to jump around a bit. Using system cards allow me to write down a goal, or a plan, and then expand upon it by adding another thought to another card, and then arranging those plans and thoughts into their appropriate positions within a framework of other plans, thoughts and goals, all written down. At the end of my goal setting session, I then have a stack of 3×5 system cards in a generalized order that then becomes my list of goals. I like to use cards of different and many colours, though I’m not regimental in sticking religiously to the colours. I just like to use a different colour for a different idea, or sub-goal, if you would call it that. You have a purpose, so your environment needs to facilitate that purpose. Some choose a quiet room. Others choose a comfortable chair. Some prefer an inspirational view. Others prefer no view. A view to them is a distraction. Work with what’s best for you. For me, I like to be looking outdoors. Sometimes at a desk. Sometimes in a comfortable chair. It’s horses for courses. Last time I set goals I chose the kitchen bench at the farm. Start with a list of categories. The best way to begin a goal setting session is to start with a list of categories. I’ll write a few categories on a few different 3×5 cards, just as headings, just to get the thought juices going. Once I’ve got a list started, then I’ll return to one of those categories, and get started in earnest on the goals list for that category. Your list of categories does not need to be complete before you start writing goals. It can be a list of one. Or two. It just needs to be a category. Then you can start expanding on that category title. Now I didn’t create the whole list holus bolus first up. Do you try to block out all other non-goal thoughts while you’re setting goals? At other times, and this is what happened last time, because I had another creative task to work on, I ran that task in tandem, with it’s own set of system cards as well. So I jumped from goal setting across to the second task and back, as the creative juices flowed. For some people working on two things at once may be a difficult concept. If that’s you, then I’d stick to just straight goal setting. How long should goal setting take? You’ll know when it’s time to wrap it up. But like I said before, you don’t want to programme an end time, with another task to follow right on top. I find it’s best just to let the time for goal setting to run its course.. So I’ve got my list of goals David, what now? The next thing you need to do is allocate a date for completion to each goal. Because a goal without a date attached is only a dream. Add a date. Set a date. Make it a true goal. Make it a mission. Once you’ve assigned your completion dates, then you can go about prioritising your tasks for each goal, and organising which tasks you’ll do when. Some goals may have distant completion dates, but need action taken sooner rather than later. Other goals may be short term, but can be put aside for a short while to be begun at a time closer to their completion date. This is where using the system cards allows us to “lay out” our plans and create our time line. It’s important at this point to look at your time line, and look for balance. Your goal list should be a balanced mixture of short term, medium term and longer term goals. With an emphasis on shorter term for two reasons. A list lacking in short term goals never gets started. It gets put off. And put off. Distant goals become dreams, and then ideas, sadly. Someday ideas. Someday is not a great date to complete a goal. It’s an even lousier day to start a goal. The second reason for having short-term goals is it creates some success momentum early in the process of achieving goals. If goal setting were easy everybody would do it. And there’s the secret. Because it’s been proven that goal setters are higher achievers than those who do not set goals. So if you want to be successful, or more successful, you need to set goals. Do I really need goals? No one really needs goals. But goals, and having goals, adds purpose. So you work it out…. if you want purpose in your life, in your work life, in your family life, in your health, and in your fitness, and in your finances, do you think having goals is maybe a good idea? So when should I start setting goals? How do I use my goals, David? So you have your goal list now? Let’s talk about the use of a goal list and the process of reviewing that list. And the benefits of reviewing that list. I’ve mentioned many times, that at a meeting of exceptional and high achieving dentists held in Australia in May 2011, Dr Omer Reed stated that in the USA, ninety five percent of dentists will not have reached their own Independence Day by age sixty-five. He defined Independence Day as being that day in a person’s life where they can literally walk away from what they are doing for a living knowing full well that they have the ongoing income and investments to maintain the lifestyle and choices they so desire. Sadly this means that at age sixty-five, only five percent of dentists are able to walk away from their drills, if they so desire. Ninety five percent of dentists at age sixty-five are still working because they have to. This means that really nineteen out of every twenty dentists are doing it wrong when it comes to planning and achieving a great lifestyle in requirement. So what’s this got to do with goals, David? Studies have shown the benefits of goal setting. Only three percent of the population set goals and review their goals. Yet studies show that that three percent of the population achieves dramatic success and substantial wealth far more than the remaining ninety seven percent of the population who do not seriously set and review goals. Do you think there may be a correlation and points of commonality between the five percent of dentists who reach Independence Day, and the three percent of the population who set and review their goals? Before we discuss the reviewing of your goals, I’d like to clarify and define my meaning of the word *Goal*. An online dental chat forum discussing goals drifted around what I believe needed to be a true definition of what a Goal really should be. Some of the items that some of the dentists called goals, I call to-do items. To me a goal should be difficult to achieve. A challenge. A challenge to get there. A difficult process. I don’t believe a visit to Disney fits the description of being a true goal. I think it’s something you should do. It’s something you can do any time. But a true goal? I really think that it is not a goal as such, but a to-do item. Maybe it is a bucket list item? The way I see it, goals are pretty well out there. They are things that you want to achieve, but you don’t know whether you can or not. Goals are things that challenge us in achieving them. That stretch us. That require commitment and discipline to achieve them. Discipline of action. Discipline of purpose. That being said, there probably is a small grey area of overlap between one person’s goal and another person’s bucket list. But not that much overlap. I think in travel there may be some overlap. Like visiting somewhere exotic. Like the top of the Eifel Tower. Is that a goal? Or a bucket list item? As a golfer, I always wanted to play golf on St Andrews. The Old Course. The home of golf. I’m not sure if it was ever a goal as such. It was certainly a bucket list item. The reason being there is a definite process of getting a game of golf there. It is achievable and doable. It just requires planning. I’ve visited Scotland four times. I’ve played golf at St Andrews, on the Old Course, four times. Was it something that challenged me in achieving? Did it stretch me? Did it require commitment and discipline to achieve? Discipline of action? Discipline of purpose? Maybe in the early days, travel items are a cross between goals and bucket list. But because it is a definite process, and a process available to everyone who can play golf, getting a game on the Old Course soon becomes a bucket list item. So back to goals, really! It’s been said that goals need to be smart. Smart goals. S. M. A. R. T. Smart! Specific: Exactly what, where, how. Measurable: A measurement gives feedback along the way, and let’s you know when the goal has been met. Achievable: Goals are achievable. A stretch, but can be done. Relevant: Goals are relevant to you and who you are. Not whimsically unrelated. Time Based: What time frame is required? Set specific dates for the completion of relevant tasks to achieve the goal. For a goal list to be successful it needs to be reviewed regularly. Images need to be seen. Regularly. Words, numbers and descriptions need to be read. And can be heard. Or can be listened to. And there is no negotiation here. Or even better, multiple times per day. The more times that goals are reviewed and presented front of mind, the more they become more relevant, more specific, more achievable and more measurable. Out of sight, out of mind, is the antithesis of purposeful goal setting. Someday is not an option for reviewing goals. Reviewing is a must do. Reviewing goals is a non-negotiable requirement in successfully achieving goals. Are you going to create your goal list?